Announcing the longest-running, most-successful science fiction series to hit television and the world by storm–I give you, Doctor Who. In the short time I have been alive, many shows, books, and ideas have captured my undivided attention. But nothing is more intriguing and adventurous than Doctor Who. I will leave most of the story telling to Wikipedia for the history of this amazing show, but here is the short version for those who have resisted this renewed love for the Doctor. 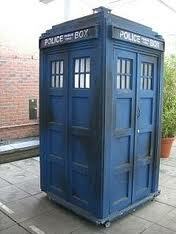 Since 1963, the Doctor has traveled through time and space in the T.A.R.D.I.S. to save various races and events in time. There have been 11 incarnations of the elusive Time Lord as he takes trips to the destruction of the Earth and planets. The most recent series picked up in 2005 with Christopher Eccleston as the 9th Doctor and the T.A.R.D.I.S. is currently in the able hands of Matt Smith. The series has created a new army of time-traveling, dalek-fighting fans that have welcomed each new doctor with open arms. I have only started the new series beginning in 2005, but so far, the show has amazed and shocked me. It is no wonder it is one of the most acclaimed shows to come out of Great Britain. Strange alien races defy the audience’s previous notion of outer space, and there is technology that would confound scientists today. 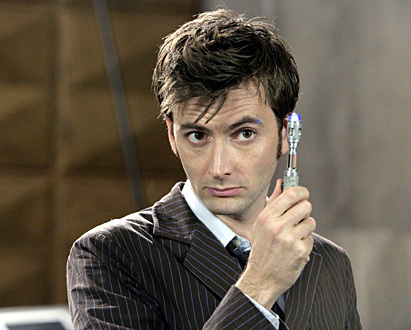 Since I have only experienced two incarnations of the Doctor, what I’m about to say is purely speculation until I have seen every one of them, but the Doctor that is by far the best is….DAVID TENNANT! The tenth incarnation of the Doctor has the tenacity and energy to thrill every episode. Even more so, David Tennant manages to, in every episode, bring a sense of wonder to the human race that has not been shown so much in the Doctor. It also helps that he has dashing good looks. The status of science fictions shows these days is depressing. Special effects cost too much, and send the good shows to an early grave (Eureka). Some manage a good run (Fringe), but they never last long. For Doctor Who, life goes on forever. Reincarnating as a new Doctor for the rest of time, and eternally traveling with new companions. How many Doctor Who fans are out there? 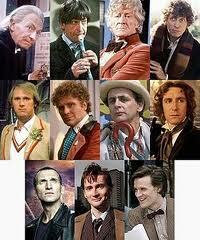 Which Doctor is your favorite and why?